When we first used Amazon Fresh, the shipper supplied fully reusable soft sided rectangular bags. Now they have switched to large paper bags (photographed above). What's also changed is that they are no longer picking up the shipping bags for reuse. While our locality and state have not yet banned plastic bags, there is already discussion that switching to paper is better, but not great. There's no substitute for reuse. The new Fresh bags are big, thick, and except for paper tape applied over the top, seem to be mostly reusable, but the original ones they'd employed seemed good enough for 50 or more uses. No doubt there were / are challenges. The reused products might need to be cleaned, and sorted to determine which ones simply couldn't be reused. People might put pet litter in them. People might not fold them properly and make pickup inconvenient and inefficient. Yes, people might need some additional modest incentives -- though, of course, they shouldn't. There are points where costs and sustainability will converge. For instance, Amazon already encourages the use of "last mile" pickup stations, which might produce a net decrease in transportation costs, though that is highly dependent on consumer driving patterns. In our case, with little driving happening and living in a fairly dense suburban area, the Amazon route might well be more efficient than a one-off pickup trip on our part. Staying tuned on that. 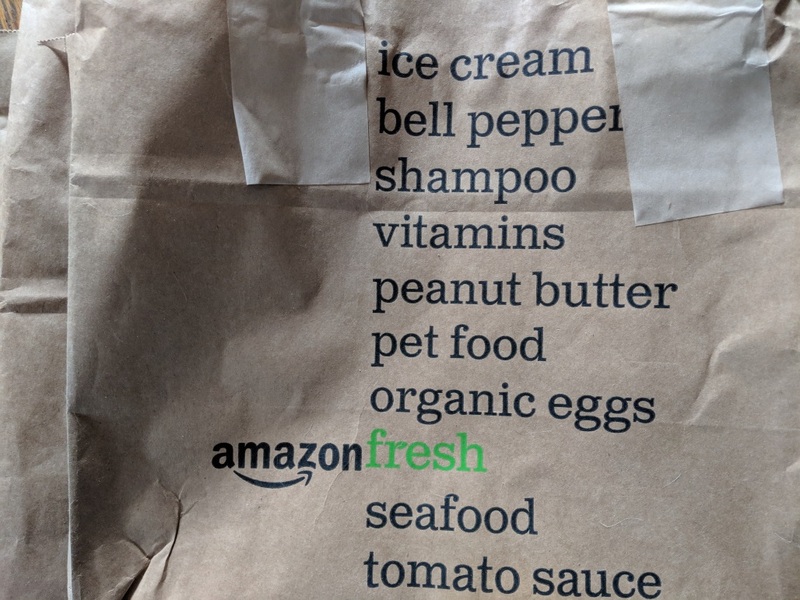 As a user of many Amazon services: household cleaning, electrician, Fresh, Alexa, and of course, AWS, one wants to be able to depend on corporate ethical standards to optimize for sustainability along with other variables. Here that instinct seems pretty subliminal. In fact, there's no reference to it anywhere in the delivery inserts, nor, in a casual search, the online Fresh instructions..